On Friday, the government's Bureau of Economic Analysis reported that the nation's economy contracted at an annual rate of 0.7 percent during this year's first quarter, a sharp drop from the barely positive 0.2 percent it estimated a month ago. Ignoring for now the current absurd allegations that Friday's reported decline overstates how bad things are because the BEA must not be properly performing its seasonal adjustment calculations — a matter I will address in my next column — I'm more than a little surprised that the contraction wasn't worse. Many key components of what the nation's gross domestic product truly is — "the (real) value of the production of goods and services in the United States" — turned in seasonally adjusted first-quarter results far below those seen last summer and fall. In certain key instances, the first quarter of 2015 actually came in below the far more winter-ravaged first quarter of 2014, effectively reversing all of the growth occurring during the quarters in between. A few examples follow; all dollar amounts presented are in millions of current dollars. Remember that the government's reported 0.7 percent contraction is annualized, meaning that the raw decline during the quarter was roughly one-fourth of that figure, or 0.17 percent. The effect of the first quarter's 1.16 percent decline from last year's final quarter is roughly 4.5 percent on an annualized basis. This is what happens when household income is still in the pits and job growth is disproportionately in part-time and low-wage work. 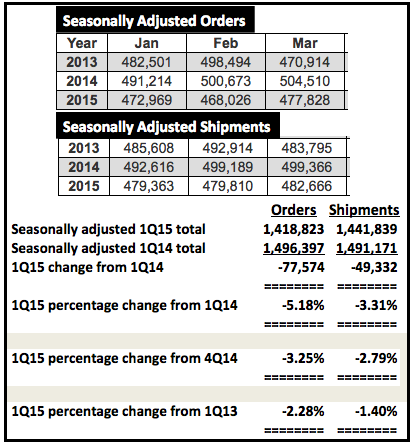 As calculated above, 1Q15 orders and shipments were both well below last year's first quarter. 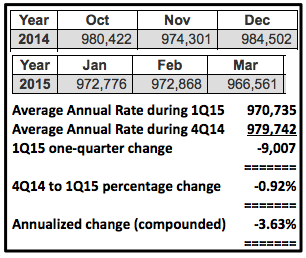 They also trailed last year's fourth quarter, and even the first quarter two years ago. It's hard to see how all of this can be happening in a genuinely growing economy. 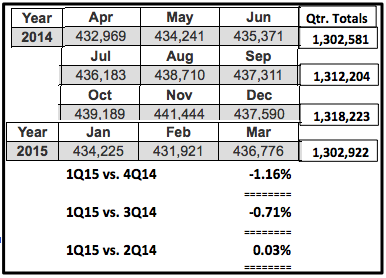 The annualized contraction in shipments based on the 4Q14 to 1Q15 decline is a shocking 11.6 percent. By contrast, last year's first-quarter construction spending decline, during a much more brutal winter, was less than 0.2 percent (0.64 percent annualized). Even if Friday's reported GDP contraction is accurate, the factors I have cited here should be cause for serious concern going forward.